Kit Carson (b. 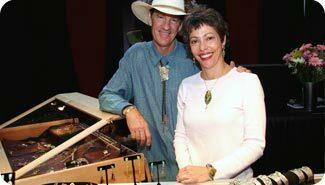 1948, Castle Hot Springs, Arizona) is an artist and jeweler, who lives and works at “Cactus Camp” in New River, Arizona with his wife, artist Aryana B. Londir. Carson grew up on a dude ranch in Arizona with supportive and energetic parents. He later attended the University of Oregon where he studied engraving, drawing, and sculpture. Influenced by his childhood the themes in his work include the southwest, cowboys, Art Nouveau, desert animals, dragonflies, and the Day of the Dead. Influenced by the Arts and Crafts movement, his work pays homage to the romanticism of the 1950s American West. David Gurney (b. 1958, Garden Grove, California) is a potter and painter. He received his MA in ceramics from California State University, Fullerton. 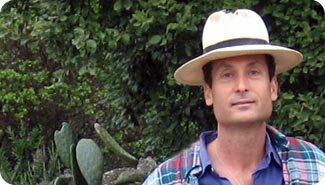 He now lives on California’s Central Coast, where he maintains a huge garden and a sustainable life style. His work is influenced by nature, food, Mexican folk art and his childhood, growing up in a time of abundant orange groves and strawberry fields. George Nakashima (1905-1990) was a woodworker, born in Spokane, Washington. He attended the University of Washington and received his Masters in Architecture from M.I.T. 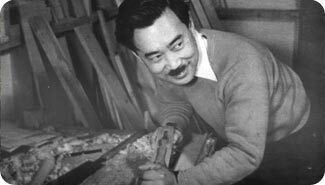 During WW2, he was placed in an internment camp where he learned woodworking from a Japanese carpenter. In 1943 he opened a woodworking shop and studio in New Hope, Pennsylvania and employed some of the world’s finest craftsmen. Today the Nakashima Studio is operated by his daughter, Mira Nakashima-Yarnall. 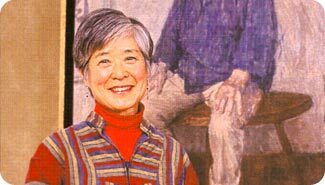 Mira Nakashima-Yarnall (b. 1942, Seattle, Washington) has followed her father’s path by becoming a woodworker. She attended Harvard University and received a Masters degree in architecture from Waseda University in Tokyo. She worked with her father, George Nakashima, for many years, as a colleague and designer in his workshop. Since her father's death in 1990, she has been the creative director of the Nakashima studio, in New Hope, PA, where she continues to produce her father's classic furniture designs and to design and produce her own work as well. She lives with her family at the studio compound in New Hope, Pennsylvania. Richard Notkin (b. 1948, Chicago, Illinois) is a ceramic artist who works in Helena, Montana. Influenced by the tradition of Yixing pottery, his work is a vehicle for political commentary. He received his BFA from Kansas City Art Institute and his MFA from the University of California, Davis. 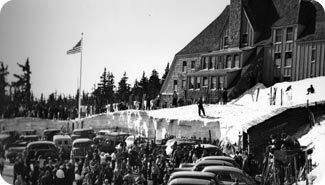 Timberline Lodge was built by the Works Progress Administration in 1936 in Northern Oregon. It was dedicated in September 1937 by President Franklin D. Roosevelt, and he declared it a venture made possible by the WPA to represent new opportunities in the United States. Artists working under the Federal Art Project created works and furnishings for the lodge, which remain intact today. The lodge is an inn and ski resort, but it is also a museum—housing a catalogued permanent exhibition of American design, painting, and craft work of the 1930s. The building was declared a National Historic Landmark in 1978. Jan Yager (b. 1951, Detroit, Michigan) is a jeweler. 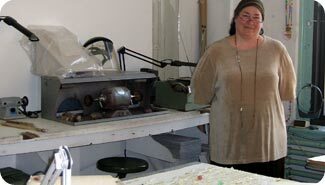 She attended Western Michigan University and received her MFA from the Rhode Island School of Design. 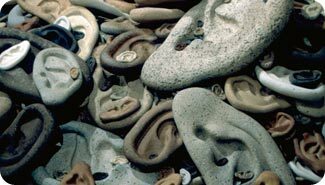 She is well known for her use of nature and found objects in her work. She currently has a studio in Philadelphia, Pennsylvania, where she uses urban flora, such as the parslane weeds that grow through the cracks in the pavement, to embellish her silver and gold tiaras, brooches, earrings and necklaces. She uses urban cast-offs, such as crack vials, to create jewelry that comments on contemporary society.